army professionalism below 50 (i.e. 15% at 0, 0 at 50% or higher). leader assigned can be drilled (unless it is composed entirely of mercenaries). While drilling it will incur the full maintenance cost regardless of the army maintenance slider on the budget screen, and its morale will be lowered severely. 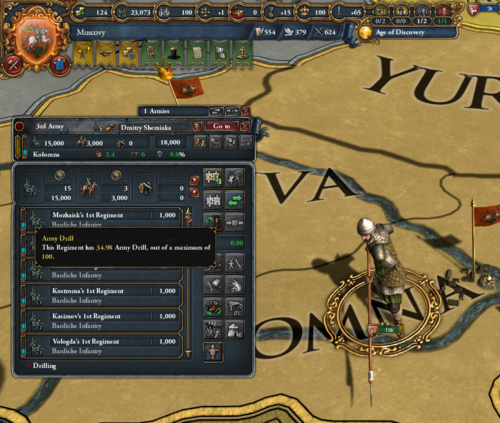 At the end of each month, the drill value of each non-mercenary regiment in the army will increase by a base of +0.83 per month, amplified by any drill gain modifiers. leader of the army also has a chance of gaining additional leader pips. This likelihood depends on how much of the army they are drilling, relative to the force limit (around 10% yearly chance at 100% of the force limit currently drilling in a single army led by the leader).